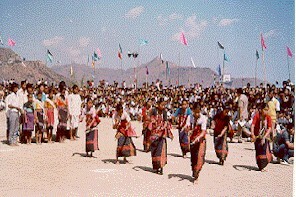 The Census of India 2001 put the Chakmas’ total population at 71,283 in Mizoram, and constituted the second largest tribal community in the state with 8.5% - only next to the Mizos who constituted 77%. The Chakmas have distinct culture, dress, language and follow Buddhism while Mizoram is a Christian majority state (90.5% are Christians). The Chakmas face discrimination in all spheres of life for being “different”. The Chakmas gained the Chakma Autonomous District Council (CADC) in 1972 to protect and promote their distinct culture and identity and freely choose their own political, social and economic goals. But the District Council covers only one-third of the Chakma population in the state. The Chakmas living outside the District Council (including Sajek Valley area) are subject to regular harassment and discrimination by the State government in various forms. Sajek is the name of the river which divides India (Mizoram) and Bangladesh. The villages situated along the river Sajek are collectively known as Sajek Valley area. Sajek Valley of Mizoram is one such place where people live impoverished lives without access to basic human needs and without “hope” because there is none to provide one. The Chakmas have been living in acute poverty and without access to basic healthcare, education or safe drinking water facilities and infrastructure such as roads, electricity connectivity etc. Children do not go to school in many villages because there is no school to attend to or because they have to work at home or in the agricultural fields along with their parents. Most Chakma household depends on slash and burn method of cultivation (JHUM) which require shifting places every year. But as forest cover has depleted and production has become less, another name for life of the Chakmas has become “struggle for survival”. Although the government has established primary schools under Sarva Shiksha Abhiyan (SSA) programme, there is no high school in most villages. The state government does not establish any school on its own. Hence, most students cannot study beyond Middle School level. Often, their lives are spoiled. Although Mizoram’s overall literacy is 88.49%, the rate of illiteracy of the Chakmas is very high. According to Census of India 2001, the Chakmas are the most illiterate community in Mizoram. They have registered a literacy rate of only 45.3 per cent, way behind their Mizo counterparts who are at 95.6 per cent. The gape is huge between males and females amongst the Chakmas: while 56.2% of the men are literate, the literacy rate of women is only 33.6%. In case of the Mizo tribes, male and female literacy stand at 96.8% and 94.4% respectively. This is a glaring fact of under development of the Chakmas in Mizoram. There is a new problem. A total of 5,790 Chakma tribal families consisting of 35,438 persons from 49 villages will be displaced due to the ongoing fencing along the India-Bangladesh border. The fencing is being erected by Ministry of Home Affairs, India to prevent cross-border terrorism and other anti-India activities. The government has not promised any resettlement and rehabilitation to the displaced Chakmas. The Sajek valley areas are most affected as the villages are on the international border.